In order to facilitate international sports exchange, foster Taipei City’s relationships with other foreign cities improve the performance standards of domestic athletes and encourage citizens to take interest in sports, the Taipei City Government has endeavored to host international sports events such as Tour de Taiwan, the Taipei International Freeway Marathon and the 2009 Taipei Marathon. Taipei International Freeway Marathon – the first marathon ever held on a freeway. The 4th Tour de Taiwan road bicycle race was held in Taipei City in conjunction with the Taipei International Bicycle Show, which takes place in March. The 2009 Tour de Taiwan included seven stations and the final stop was Taipei City on March 14 near Taipei City Hall. Prior to the events in Taipei, the organizers also hosted the Citizen Elite Challenge in the hopes of encouraging the citizens of Taipei City to take part. More than 20 teams from Korea, Switzerland, Australia and Japan took part in the race along with hundreds of experienced cyclists . A scene from Tour de Taiwan. The Taipei International Freeway Marathon kicked off on March 15, 2009 at 6:00AM. The starting point was the Wugu and Xizhi Overpass on National Highway No.1. Almost 10,000 runners indulged in the fun of road running under a brilliant sun. The event was divided into two categories: full marathon and half marathon. The Taipei International Freeway Marathon was the first event of its kind in Taiwan. The marathon was a tremendous success; thousands of enthusiastic runners gathered at the starting point at the break of dawn. In an effort to promote water sports and recreation, the Taipei Sports Office hosted a series of events including General Water Activities, Weekend Canoe Experience for Citizens, Taipei Rowing Championships, Water Activity Recreation Camp and Junior High/Elementary School Student Summer Vacation Water Camp from May through October of 2009. Almost 10,000 citizens took part in these events and the response reflected the growth in the population of people engaging in water sports. These events provided opportunities for citizens to appreciate water sports. 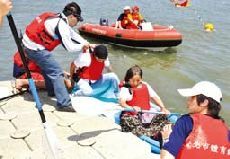 Through the planning of water activities, the office hopes to make Tamsui River come to life again and revitalize the river. 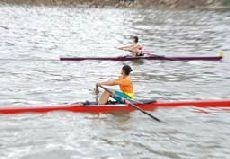 The 2009 Taipei Rowing Championships were held at Dajia Riverside Park on April 24 to 26. These events attracted skilled rowers from schools and organizations across Taiwan. The success of the event reflected the fact that more and more people have taken a liking to water sports, making rowing and canoeing the most unique water activities in Taipei City. Chinese Taipei V.S. Kingdom of Tonga. The FIVB Men’s Volleyball World Championship has been touring major cities across Asia to host qualifying rounds and it has already become one of the biggest events in the international volleyball scene. The championship offers the opportunity for Asian teams to play the finest volleyball teams from around the world, allowing them to hone their skills and accumulate experience. In recent years, teams from Asia have performed incredibly well and secured top rankings in the championship. The success of Asian volleyball teams in the championship has captured the attention of the general public and media coverage. 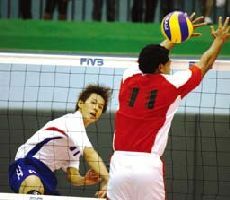 The 2010 FIVB Men’s Volleyball World Championship-Asia Second Qualifying Round was held from May 22 to 24, 2009 with four teams competing: Kazakhstan, Kingdom of Tonga, United Arab Emirates and Chinese Taipei. The event served as an opportunity of athletic exchange and allowed Taiwan’s volleyball team to accumulate experience and gain international exposure. "The 2009 OEC Taipei Ladies Open. 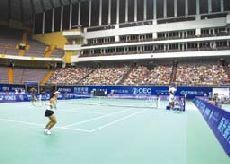 “The 2009 OEC Taipei Ladies Open” was held from November 2 through 8, 2009 at Taipei Arena. Renowned female tennis players from around the world took part in the event and played against the best from Taiwan. Coupled with the Taipei City Government’s marketing campaign for the city, the event not only served as a sports cultural exchange but also bridged Taiwan with the rest of the world and improved Taiwan’s international image. “The 2009 IIHF World U18 Championship Division III Group A” events were held from February 27 through March 5 at the Taipei Arena. National teams from Australia, New Zealand, South Africa, Mongolia and Taiwan took part in the event. The event served as an opportunity for athletic exchange and allowed Taiwan to gain more international exposure and improve Taiwan’s image. The 2009 Taipei Marathon took place at Taipei City Hall Square on December 20, 2009 and it broke the record in terms of the number of runners with more than 100,000 runners participating in the marathon. The marathon is known around the world as the largest city marathon, even exceeding the famous New York Marathon. There are five different events for the marathon: the Full Marathon, Half Marathon, 10 km Run, Fubon Fun Run and Kids Run. 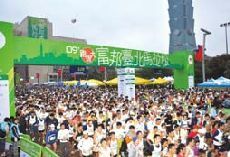 The Taipei Sports Office collaborated with Fubon Financial Holdings for the first time in 2009 to organize the Taipei Marathon and invite runners from all over Taiwan to take part in the event. As an incentive to motivate local and foreign runners to do their absolute best, the sponsor provided a record-breaking cash prize – NT$1.33 million for the first runner to break the previous record time and NT$200,000 for the first finisher from Taiwan. 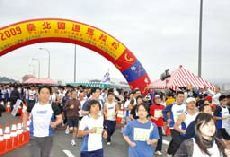 The cash prizes added up to a total of NT$5.14 million, making the 2009 Taipei Marathon the most lucrative marathon event in Taiwan. Close to 26,000 runners took part in the event and the number of runners attempting the full 42 kilometers grew by 20%. The Bring a Rookie Along event offered 120 groups of experienced full marathon runners to team up with first-time runners to compete in the event; the Healthy Corporation Runners event was an open invitation for the top 100 corporations in Taiwan to challenge their employees to run the marathon (Chunghwa Picture Tubes came in first with 1,240 employees signed up for the event). In addition, the organizers also included the Celebrity Charity Run & Children’s Interschool Cup event in the marathon, drawing almost 500 runners from 46 schools to warm up for the 2 km Kids Run. In the past five years, the Taipei Marathon has successfully brought together charity and road running. In 2009, the organizers kept up with their efforts towards charity – for every kilometer completed by runners, Fubon Financial Holdings donated NT$1 to charity organizations. The charity donation exceeded NT$10 million at the end of the marathon. In addition, 1,220 Taipei Marathon T-shirts were sold through Fubon’s Momo shopping network and the proceeds also went to charity. The organizers have made special efforts to emphasize environmental protection and technology for the event: the eco-friendly electricpowered cars were provided for the judges and for time-keeping; the positions of all runners were tracked through GPS systems and all runners wore racing bibs with racing chips to relay results instantaneously in order to obtain runners’ results in real time. In 2009, the organizers planned more than 50 cheering stations along the 42 km route by calling for assistance from schools and communities in all 12 administrative districts and for more than 2,000 volunteers to ensure that the event would be an outstanding international marathon in terms of safety and hospitality. 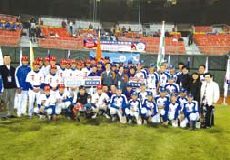 Group shot of athletes taking part in the Taipei International AA Baseball Invitational Tournament. The 2009 Taipei International AA Baseball Invitational Tournament took place from December 24 through 27, 2009 at three different venues: Tianmu Baseball Stadium, Xinsheng Baseball Stadium and Shezidao Baseball Stadium. A total of 20 AA baseball teams from China, Japan, Korea and Hong Kong competed in the tournament, which not only facilitated international sports exchanges but also expanded the international vision of young athletes.